-Composite image consensus, written by Patti Radle and Crystal Tamez with the agreement of the mural crew. ​ The mural crew came up with the design for Peace and Remembrance by brainstorming images that would make people think of peace, including parks, supportive friends, and religious symbols like the Lady of Guadalupe. Starting from the upper right corner of the mural, a line of people process towards a shrine for the Virgin of San Juan. These characters represent the diversity of the Westside community, united by memories of their loved ones. The pond in the bottom right corner of the mural comes from a design drawing by Julie Ibarra, who wrote: “This park is for people who want to share their peace.” St. Francis stands in a little rock alcove by the pond, holding a bird and watching over the animals. A log fastened to the tree in the center of the mural makes a cross. Jesus stands on the other side, stepping down from the cross to answer the violence committed against him with love. He releases a dove, a symbol of peace, from his open and outstretched hands. The dove flies over buildings and basketball courts, features of the Westside community. The dove flies towards an Aztec sun, which shines with the names of mural artists and of community members lost their lives to violence. The colorful bricks on the far left of the mural each hold a name. Patti Radle, co-director of Inner City Development, initiated this mural project. The crew was a group of middle school girls that collaborated on Flower Power two years earlier. 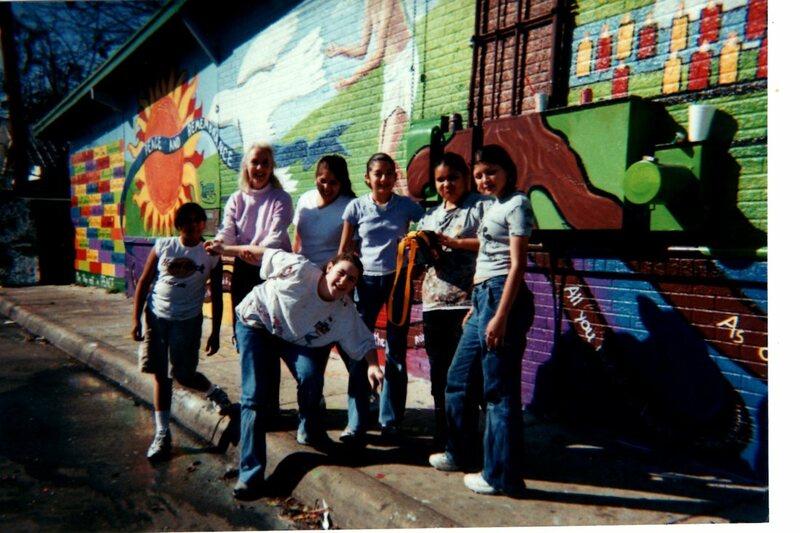 The young artists knew the mural was going to be a memorial for Westside victims of inner city violence, but were empowered to design and paint the mural on their own. Through a series of sketches and planning sessions, they came up with a final design for the mural. The crew began by whitewashing the wall, then sketching out the mural, and finally painting in the images. The wall itself has a complicated story. In the 90s, neighborhood teens spray painted a small mural onto the same convenience store wall in memory of Charles “Chucky” Hernandez. Chucky had been the victim of a violent death in the barrio. A year and a half before Peace and Remembrance, that mural was painted over and the wall quickly filled with tagging and graffiti. The artists wanted to preserve the wall’s dedication to Chucky, and so painted his name in the center of a flower near the lake. At the mural blessing, community members with loved ones on the wall shared stories, memories, and reflections, and gathered to place flowers in front of the wall. Father Marty blessed the mural with holy water and a group of Aztec dancers performed a traditional dance. Since that first mural blessing, San Anto Cultural Arts has made a yearly Dia de los Muertos procession to the Peace and Remembrance mural. For the first several years, the procession began and ended at San Jacinto Senior Homes. Since San Anto acquired the 2120 El Paso building in 2010, the Centro has been home base for the procession. Every year, the procession adds at least one new name to the mural. San Anto Cultural Arts has partnered with the Peace Initiative, an organization founded by Patricia Castillo to prevent and respond to domestic violence. Patricia supplies names for the wall so that Peace and Remembrance honors many victims of domestic violence. The procession and the mural are not meant to perpetuate grief, but to invite people to share and celebrate their loved one’s lives. Every event includes time to sing, dance, tell stories, and place photographs of family and friends on the Dia de Muertos Community Altar.